Your child is not transported anywhere! We offer half-hour to 45-minute classes (depending on age) at a number of pre-school and daycare centers, as well as the YMCA summer youth program. Special events (parties and picnics) are generally 1.0 hour long. Emphasis is on motor skills, tumbling, hand-eye co-ordination, and large muscle control. We teach many important skills and words that are essential to a child’s development. Such skills include respecting others, waiting their turn, praising others, being rewarded for good behavior and following directions. Tiny Tumblers is a unique and innovative way to teach tumbling and movement education to children. We bring our program to your child’s facility, and provide quality instructional tumbling and movement education for a full thirty minutes. Classes are taught at the preschool or daycare unless you come to the bus stop. 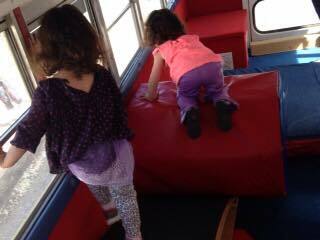 We utilize a variety of preschool fun shaped mats and customizable layouts. Our colorful equipment is designed to teach and excite students while learning the fundamentals of gymnastics as well as improve their athletic abilities including coordination and self-confidence.